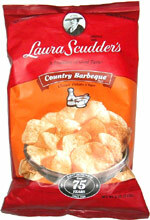 Taste test: These are pretty good potato chips, they have a sweeter barbecue taste than regular barbecue chips. I prefer the sweeter variety than the smokey barbecue, so that's a plus here. The chips themselves look a little oiler, but surprisingly didn't taste oily at all. I could definitely see myself eating a full bag of these, the barbecue flavoring was that good. Smell test: No particular smell on these. Trivia: These got squished in my carry-on bag returning from Las Vegas, so they might not be as small as we saw them. This snack was discovered by Keith in Las Vegas. Review published .